You guys know me. I love glow in the dark polish. So you know I had to find a way to work it into some holiday nail art! What better way to do it than by making actual light-up Christmas lights!? I started with a base of Nfu Oh JS15, a sky blue jelly. I chose this color to help reinforce the idea that this was the "daytime mode" of this nail art. Then, using my It's So Easy Nails Stripe Rite in Black, I added the cord and the little socket areas that the lightbulbs screw into. 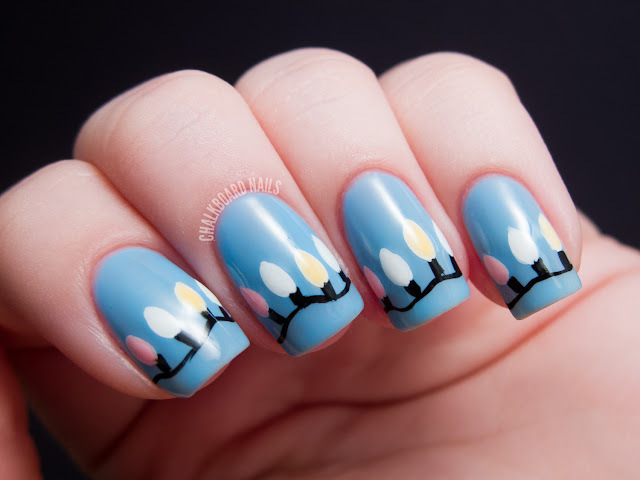 Using OPI Alpine Snow, I painted white lightbulb shapes. 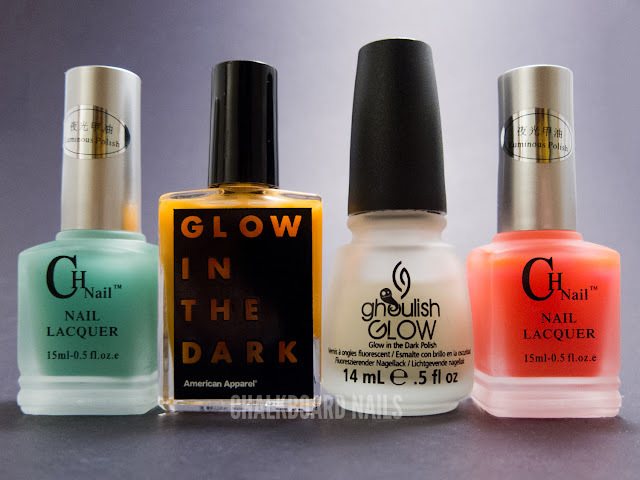 Then I went over the bulbs with my glow polishes: American Apparel Jupiter (the orange), China Glaze Ghoulish Glow, CH Nail #12 (the pink) and CH Nail #02. Here are the pretties in the dark! These did glow different colors but for some reason the camera just made them look either green or blue... you can see on CH #12 (the pink polish) it sort of glows violet in photos but it did look more pinky-red in person! I just love glow in the dark polishes so much. It's almost problematic. So, what do you think? Did I accurately represent the majesty of Christmas lights? ARE YOU FEELIN' THE HOLIDAY SPIRIT!? This is AMAZING! I love it so much. This is really a great idea! This idea is SO cute! wow, i've never seen anything like it.... what an absolute amazing idea!!!! This is FANTASTIC- such a great idea! Love these times a million! Those look SO COOL!!! 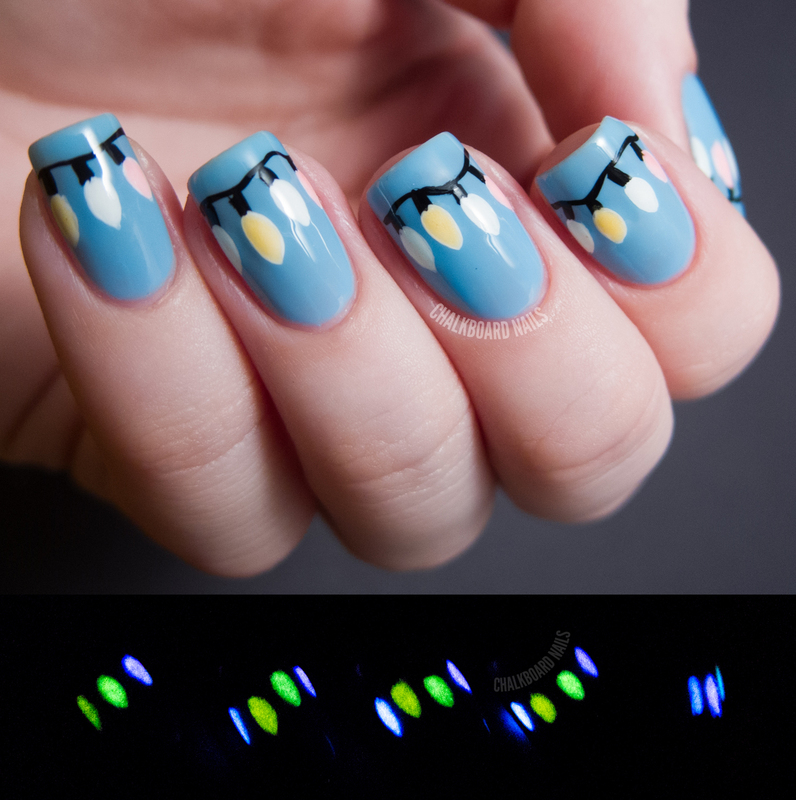 I really need to get myself a decent glow-in-the-dark polish, I feel like there are so many cool ideas that can be done with them. But amazing designs, your mind is brilliant for coming up with ideas! 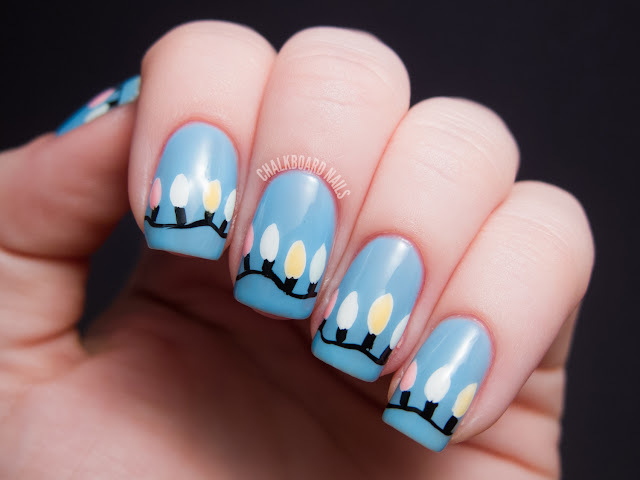 This is a super fantastic mani! That is REALLY cool!!! Very creative design and super pretty. It looks so delicate in the day light... but still recognizable, just love it! Oh gosh. That's so awesome! Very clever! Omigosh!!! This is so cute and creative. I never would've thought of this. BRAVO!!! This idea is genius! Love this design, you're so talented. Oh wow. I don't normally like nail art (too flashy for me), but this is truly amazing. Bravo! What a fun, creative idea! I just love this!! These are soooo cool!!!! Such a good idea!!!! 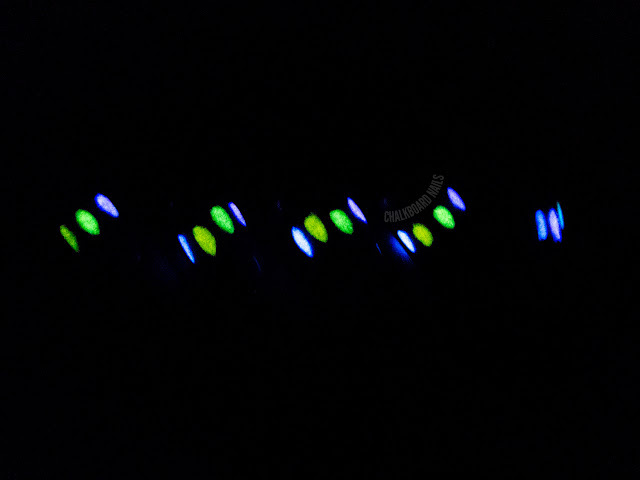 OOOOOH look at those cute cute lights! Awesome! Such an ingenious idea! :)) Awesome! 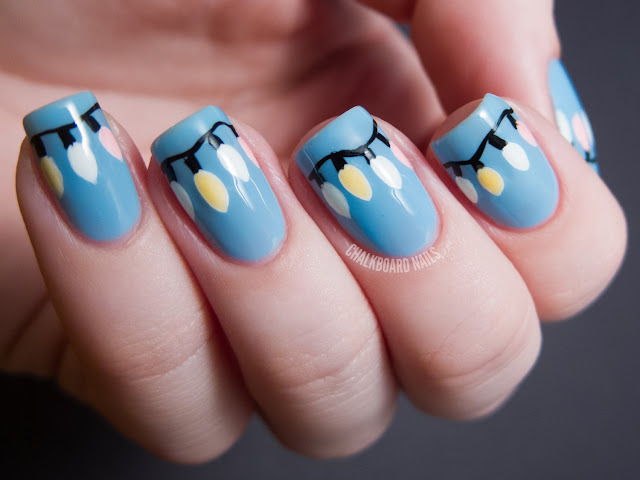 This manicure is so much fun! I am so amused by the fact that the lights actually work, haha. I love that you have different glow in the dark colours! love love love love loveeeeeeeeeeeeee!!!!!!!!!!!!!! This look amazing! Great idea! OMG this is freaking amazing!! 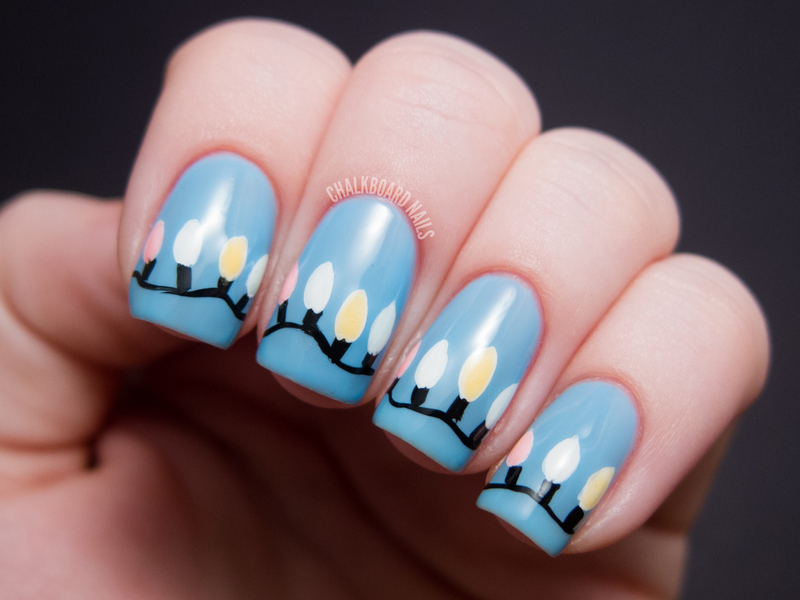 This is the most awesome holiday mani I have seen, you are a genius! I love it! That blue base is such a gorgeous colour! 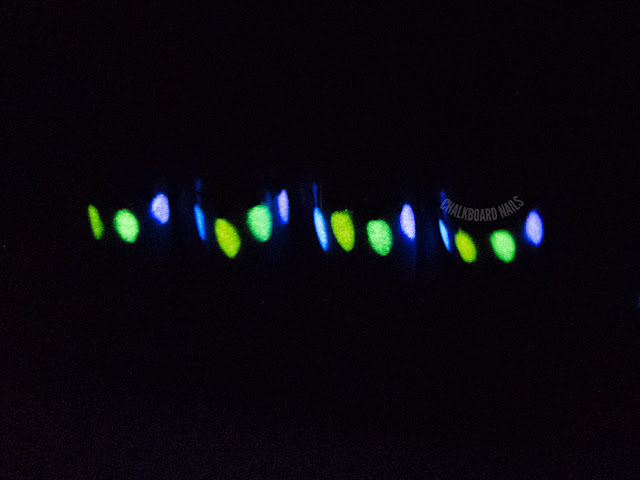 BEST use of GITD polishes EVER!! Now if they only made red, we could have Rudolph!! Oh wow your glow in the dark polishes actually glow different colors! All of mine just glow green...these look really cute! i wish i had something more creative to say than "cute", but it's sooooo cute! This is brilliant, and all of your lights work! Great job on this one! Hi, Sarah! I love this! It's so simple, but sooooooo pretty (as every thing you do)! There's a tag for you on my blog! This tutorials is absolutely fabulous..the best I have seen so far. oh my god that is all kinds of awesome!!!!!!!! Anyway, you made a very pretty and festive christmas lights.